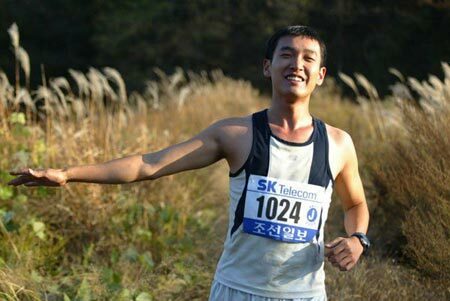 Cho Seung-Woo runs in Marathon. The Skinny: This award-winning human drama about an autistic youth training to become a marathon runner quickly became the runaway box office smash of 2005. Based on a true story, Marathon is a solid family film that delicately handles the issue of autism in Korean society in large part to due to the outstanding and utterly believable performance by its lead actor, Cho Seung-Woo. Marathon marks the feature film directorial debut of Jeong Yun-Cheol, and what a debut it is! Previously, Jeong had only directed a couple of short films and worked as an art director and an editor for a variety of other projects. But if Marathon was "under the radar" due to Jeong's first-time director status, the buzz started to pick up at the film's initial press screening when it received thunderous applause from the normally reticent South Korean press. Marathon opened in second place behind the much anticipated sequel, Another Public Enemy, but it would not stay in that position for long. Thanks to positive word-of-mouth from satisfied audiences, the film went on to dominate the local box office for a staggering nine week run with over five million in tickets sold by the end of its release. If that weren't enough, Marathon swept the 42nd Daejong (Grand Bell) Film Festival, earning six awards, including the coveted Best Picture honor. Actor Cho Seung-Woo took home the prize for Best Actor, and Jeong Yun-Cheol was recognized as Best First Time Director. Clearly, Marathon has a lot going for it in the way of critical and box office success, but is it really that good? Short answer: yes. Also known by its alternative title Running Boy, this poignant human drama tells the story of the relationship between a young autistic man named Cho-Won (portrayed by Cho Seung-Woo) and his doting mother, Kyong-Sook (TV actress Kim Mi-Sook). Although Cho-Won may be twenty years old, he has only a childlike understanding of the world. He likes chocolate cookies, loves zebras, and can memorize casual conversations and TV shows. He also tends to dance in public and pass gas at the most inopportune times. While these things may seem charming or at least humorous, this behavior can get him into a lot of trouble due to his inability to understand how the rest of the world operates. Thus, his mother controls many aspects of his life in the name of "protection," a characteristic that will have further relevance to the plot as the film progresses. As a youth, Cho-Won tended to engage in self-destructive behaviors, but with the help of the special school he attends and his mother's insistence that he participate in various physical activities, his condition quickly improved. Believing that he enjoys running, Kyong-Sook enters Cho-Won into a variety of races, and soon decides that her son should compete in a marathon, hoping he'll achieve something every amateur runner dreams of: completing the race in less than three hours. But are these high ambitions for her son's benefit or her own? Does Cho-Won truly enjoy running or has he been "trained" to agree with his mother's demands? At its core, Marathon is the traditional underdog story, but what sets this movie apart is the way in which its narrative unfolds. Early in the film, we are introduced to Cho-Won's reluctant track coach, Jeon-Wook (Lee Ki-Young). Hired by Kyong-Sook to prepare her son for the marathon, Jeon-Wook is depicted as a somewhat bitter man, a former track star obligated to do community service thanks to a DUI. He's initially skeptical of the entire situation, but eventually sees promise in Cho-Won, not just as a track star, but as a human being. From such a description, you might think this movie is about how an enthusiastic young athlete warms the icy heart of his cynical coach and how, in return, the coach gives his student the skills he needs to win the race, thus changing each other's lives for the better. Technically perhaps, this guess would prove true, but to the credit of the filmmakers, this is not how the movie actually plays out. Director Jeong Yun-Cheol shows a considerable amount of restraint by not relying on formula or convention, but instead makes filmic choices that are often subtle and innovative. Certainly, Marathon flirts with some of the conventions of the typical Korean soap opera. Not only is there the condition of autism to deal with, but also a surprise "illness" that comes into the picture later on. Thankfully, it's not a terminal illness meant to illicit a lot of tears, but instead a quick wake-up call to give the mother a chance to reflect on her behavior and wonder what the hell she's been doing to Cho-Won all these years. Is it time to lighten up and let go? And if she decides to remove him from the marathon is she really doing what he wants, or is she once again assuming far too much? These questions are pivotal to the film's final act. Marathon rests on the capable shoulders of Cho Seung-Woo, who quite convincingly portrays the autistic Cho-Won. Cho reportedly met with Bae Hyung-Jin, the real life inspiration for the movie, and observed his every gesture to make sure his depiction was as authentic as humanly possible. In his portrayal, Cho Seung-Woo's voice, his actions, and his behaviors in depicting an autistic person all ring true. Never once during the film did I think about Cho Seung-Woo "acting" as Cho-Won, but instead saw Cho-Won as an instantly believable character. While the film tackles the social realities of being mentally challenged in South Korean society, it's not entirely done from Cho-Won's perspective. Instead of focusing solely on the child, the film also explores the effects autism can have on a family, particularly the way in which a mother's "favoritism" for her special child can have disastrous consequences for the family unit. Early on, there's a sense that Kyong-Sook has driven off her husband, and her neglect of her other son has caused a sizeable rift between them. One even gets an indication that her proactive mothering may result from some debilitating guilt she harbors from a past incident involving Cho-Won. As a result, her overprotective streak eventually becomes a bone of contention that sparks a heated confrontation with his coach over what's best for Cho-Won. Similarly, a comment Kyong-Sook makes about hoping she dies the day after Cho-Won, which is meant to convey how much he needs her, takes on added significance as the narrative progresses. Exactly who needs who? Notes:  For two years, director Jeong Yun-Cheol interviewed Bae Hyeong-Jin, the real-life inspiration for the character Cho-Won. Recently, Bae has become somewhat of a local celebrity after participating in various marathons. He's even made the talk show circuit rounds and landed an appearance in a TV commercial.